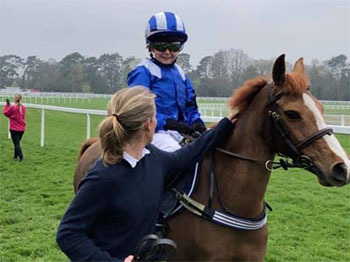 Nine-year-old Bella Crowley daughter of Jim Crowley finished third on her pony Summer Colours in the ‘Ponies 138cm and Under Novice Race’ over six furlongs in the famous silks of Sheikh Hamdan Al Maktoum. Daisy Dace daughter of Luke Dace had a double on the day and won the ‘Ponies 128cm and Under Race’ on Crofthill Montague and also won the ‘Ponies 138cm and Under Intermediate Race’ on her pony Diptford Moonwalker. Her brother Jack also had a ride on his pony Humbel Mind. Lucy Aspell daughter of Grand National winning jockey Leighton Aspell finished third on her pony Tiny Dancer in the ‘Ponies 138cm/148cm and Under Combined Open’ and Lucy’s sister Niamh also rode her pony Artic Fox. We look forward to following the next generation of Coombelands Jockeys!